A little while ago, I got a request from Kohl to post up a comparison between OPI's two shades, Hot & Spicy and Are We There Yet?, just to see the little differences. In full sunlight, Hot & Spicy appears to be a neon orange, whereas Are We There Yet is dustier, and not so bright. The camera seems to pick up more orange out of the colours than what you see in real life. This picture is the truest depiction of what I see with my own eyes when looking at my nails. 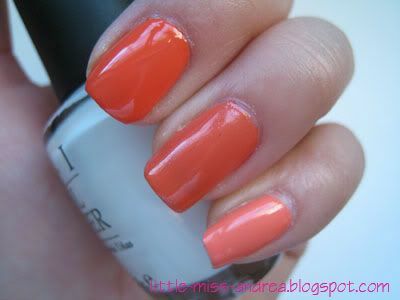 Hot & Spicy doesn't look neon under normal circumstances, but definitely a coral that leans orange. Are We There Yet is muted in comparison, and I think it is due in part to the microshimmer in the base. The last two pictures depict best the differences between the shades. Hot & Spicy is much more vibrant when comparing the two. I feel like my camera made Are We There Yet look more orange than it is in real life - it has more white in it than Hot & Spicy. It's almost like a softer version of Hot & Spicy, but packed with microshimmer, which I believe is another factor that contributes to the lighter colour. There isn't a HUGE difference between the two shades though, it's a subtle but noticeable difference. Thank you so much!! Now that I see both of them side by side, AWTY is lighter and less orange as I expected but it somehow look kinda dirtier than H&S...lol if that makes any sense. I think I will buy it since it's less vibrant but my search for coral will go on.